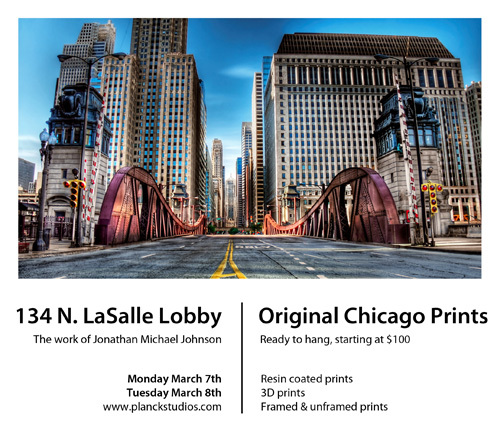 Exhibiting some examples of my new Mini Resin Prints and 3D Prints on March 7th and 8th in the lobby of 134 N. LaSalle. I'm excited to be exhibiting a batch of new work next week in the heart of Chicago's financial district. I'll be in the lobby of 134 N. LaSalle St. (map) on Monday March 7th and Tuesday March 8th. This is the first time I'll be publicly displaying my new Mini Resin Prints and 3D prints. I'll also have framed and unframed traditional color and black and white prints - and portfolios of my work to browse through. In total, there should be over 50 different prints on display. If you're in the neighborhood, stop by to say hi and check out some of my new work in person.